04:15:00 Makes 20 servings or 2 pies, 10 servings (72 g) each. Makes 20 servings or 2 pies, 10 servings (72 g) each. 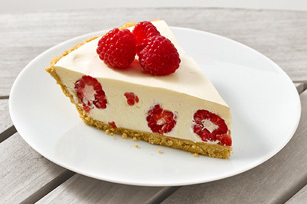 Our Raspberry-Lemonade Pie recipe makes two pies - one for now and one for later! Unless of course you’re feeding a crowd, which makes this a party-perfect dessert recipe. Mix graham crumbs and butter; press onto bottoms and up sides of 2 (9-inch) pie plates. Add boiling water to jelly powder in small bowl; stir 2 min. until completely dissolved. Cool 15 min. or just until jelly begins to set. Beat cream cheese in large bowl with mixer until creamy. Gradually beat in lemonade concentrate, then jelly until well blended. Gently stir in Cool Whip and berries. Pour into crusts. Refrigerate 1 pie 4 hours or until firm. Freeze remaining pie up to 1 week before thawing to serve. Prepare using thawed frozen raspberries. Garnish pie with additional fresh raspberries just before serving. Pour remaining lemonade concentrate into 1-L pitcher. Add 1-1/2 cans water; stir until well blended. Refrigerate until ready to serve. Serving Size Makes 20 servings or 2 pies, 10 servings (72 g) each.